I am incredibly excited to finally type those words. Haven Divided: The Dragon’s Brood Cycle, Vol. 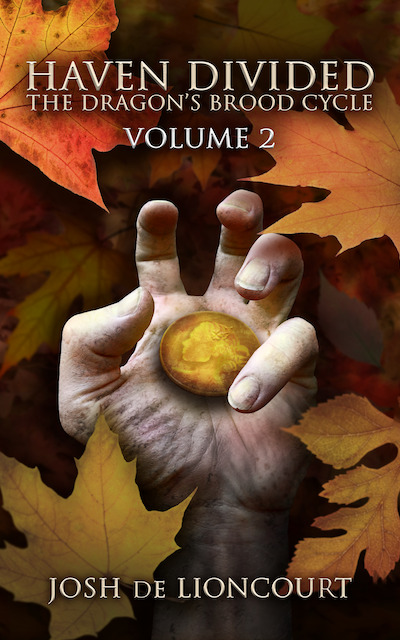 2 is available to pre-order from the Kindle store. It will be released on 31/July, and the paperback edition will be released shortly thereafter. Emily Haven and her friends have been given the seemingly impossible task of uniting the worlds—a mission they failed once before, in another lifetime. But Emily made a promise, and she intends to keep it. A small boy risked his life to save hers, and while Michael sets out to rejoin the Dragon’s Brood, she heads east with Celine and Corbbmacc to rescue Daniel from a band of desert slavers. Time does not stand still, however, and the dark legends are true. They deal in blue fire; they deal in death; and they travel through the long nights on autumn winds. Samhain has come, and this year, the harvest will be in blood, gold, and souls.